After Stephen Donnelly reports the Troika shifted blame from themselves, Michael Noonan says: it’s Trichet’s fault. 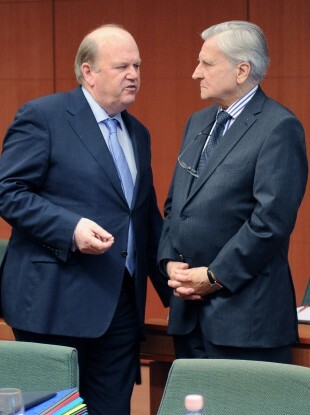 Michael Noonan speaks with Jean-Claude Trichet, the then-ECB president, at Noonan's meeting of European finance ministers in March 2011. FINANCE MINISTER Michael Noonan has again insisted that policies adopted by the Troika mean Ireland’s state-supported banks are forced to repay the unsecured and unguaranteed bonds. Noonan’s denial contradicts statements from independent TD Stephen Donnelly who was this week told by the Troika itself – during its ongoing quarterly inspection of Ireland’s progress under the bailout deal – that the policy was one adopted by the previous government. This meeting took place on Wednesday of last week – the same day that Noonan went on the Dáil record to insist that the policy was, in fact, determined by the European Central Bank. “When this Government took office it attempted to implement burden sharing with senior unguaranteed bondholders, in particular institutions that were no longer core elements of the Irish financial system,” Noonan said in response to a written Dáil question from Donnelly himself. Noonan said these policies had been discussed at length, particularly with the then-ECB president Jean-Claude Trichet in the run-up to the results of the last round of stress tests which were announced on March 31 of last year, just weeks after the government came into office. At that time the President believed that such action was not in the interests of Ireland or the Euro Area. This matter was discussed again with President Trichet on a number of occasions including the Ecofin meeting in Poland in September 2011. That Ecofin meeting was the last attended by Trichet in his role as ECB president; he was succeeded by Mario Draghi in November of that year. Noonan’s response does not explicitly discuss any individual discussions on the subject with Draghi, though the two have met on several occasions. The minister added arguments of his own, however – saying that State-owned AIB had a mandate to ensure the proper supply of banking services and that its business model remained intact. This, he argued, required it to keep its business model intact so that it would eventually be able to access funding in the usual way from the world’s money markets, and wean itself off State support. “Nevertheless, I would like to again reiterate that this Government is currently in discussions with our European colleagues in relation to securing a deal on the Irish bank debt”, he said. Email “Noonan insists: No, the Troika DID demand that we repay the bank bondholders”. Feedback on “Noonan insists: No, the Troika DID demand that we repay the bank bondholders”.